The Rhodesian ridgeback is a large, athletic, and sturdy dog breed known and named for the distinct ridge along its back. This ridge is caused by hair that grows in the opposite direction along the spine, and it is the unique trademark of this dog breed. The Rhodesian ridgeback is an excellent protector that makes a great guard dog but is also a quite worthy companion. The Rhodesian ridgeback can be traced back as early as the 1500s when European immigrants brought several dog breeds to South Africa. The settlers needed a good hunting dog, protector, and companion. Their dogs were selectively bred with part-wild "ridged-back" dogs that were used for hunting by the natives. Many different breeds probably contributed, including Great Danes, Mastiffs, bloodhounds, greyhounds, and terriers. They were used for hunting a variety of game. In 1877, ridgebacks were brought to Rhodesia, the country now known as Zimbabwe, where they were raised and further developed to serve big game hunters. The resulting breed became known as the African lion hound, as it was once used to hunt lions. A pack of four to six of the dogs was used to hold a lion at bay for a hunter. They were also used to hunt boar. The breed standard was written in Rhodesia in 1922. The breed arrived in the U.S. in the early to mid-1900s and was accepted into the American Kennel Club (AKC) in 1955. The short, smooth hair coat of the ridgeback requires little care and only sheds a small to a moderate amount. Little more than basic routine grooming is necessary for healthy ridgebacks. Be sure the nails stay neatly trimmed and the ears are cleaned regularly to avoid ear infections. Help keep your dog healthy with oral hygiene, including brushing your dog's teeth regularly. The Rhodesian ridgeback is a highly athletic and active dog that needs plenty of mental and physical exercise, at least 30 minutes daily or more frequently. You will need to keep your dog on leash and well-controlled as they are prone to chasing anything that moves. Controlling a large, excited dog on a leash can be difficult for a novice owner. This breed excels at various dog sports, including agility, obedience, and lure coursing. Finding your dog an activity he loves can help prevent boredom and anxiety. 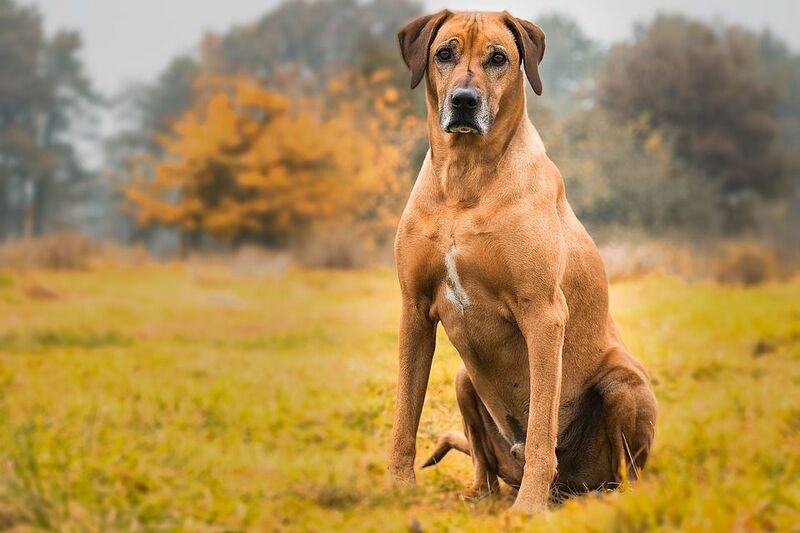 The Rhodesian ridgeback is also a very intelligent yet independent dog that needs proper obedience training and will do quite well once trained. All dogs need to be trained, but training is even more important for a larger dog like the Rhodesian. Some big dogs are not as aware of their size, so it's important to have control over your dog. Ridgebacks like to dig and make their own hole to cool off in warm weather. They also are prone to escaping fenced enclosures have a high capacity for wanderlust. You'll need secure fences that they can't leap over or dig under. With a high prey drive, they will give chase and disappear quickly over the horizon. The noble Rhodesian ridgeback is gentle and loyal towards its family, but may initially be reserved around strangers. Proper socialization starting at a young age is very important. This will help make it easier for your Rhodesian to accept new people, animals, and environments. The Rhodesian ridgeback may be appropriate for families with children as long as the dog is trained to get along with kids. No matter the breed, be sure to never leave a dog alone with small children. Unneutered Rhodesian ridgeback males are likely to show aggression towards other male dogs. With a high prey instinct, they are likely to chase small animals and cats unless raised with them. Feed your Rhodesian ridgeback two meals per day of up to 2 cups of dry dog food at each meal. The appropriate amount for your pet will depend on size, age, activity level, and other factors. You shouldn't allow free-feeding as this breed is not good at self-regulation. Gulping down food or eating too much at one time can result in boating and stomach torsion, which is a medical emergency. Resist the temptation to give your dog human food as treats. Ridgebacks are also known to consider your kitchen counters their own personal buffet and grab any food they can reach. You'll have to be wary and ensure your cabinets are also secure. Monitor your pet for signs he is gaining weight. Being overweight or obese can shorten a dog's life and increase the risk of other conditions. As your dog's nutritional needs will change over time, be sure to bring this up with your veterinarian. You can ask for recommendations for feeding schedules, types of food, amount of food, and exercise to keep your dog healthy. Be sure to provide access to fresh, clean water. The Rhodesian Ridgeback Club of the United States maintains a list of breeders throughout the world, as well as links to organizations that coordinate potential rescues. The site also has helpful articles and information for prospective ridgeback owners. As with any breed, if you think the Rhodesian ridgeback is right for you, be sure to do plenty of research before you get one. Talk to other ridgeback owners, reputable breeders and rescue groups to learn more.